April 3rd to April 6th, 2006. 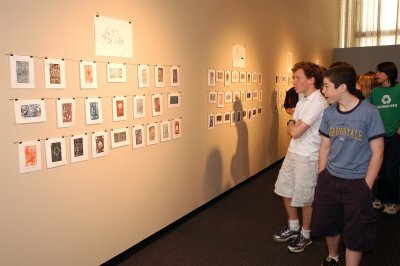 The project was displayed at the Confederation Centre of the Arts Gallery from May 15th to June 5th, 2006. "Our school took part in a program called ArtsSmarts, it was a really fun program we learned a lot of different things, I had a lot fun." "It was really fun and interesting." "I think it was good working with etching paints, paper, and different stuff, using chemicals in the water and making the picture." "Really well done! A wonderful learning opportunity." "It’s always great for everyone to try something new." "I think it is a good idea to introduce the students to new art forms."